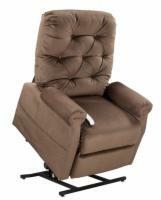 AmeriGlide lift chairs are made to offer maximum quality at the minimum possible price. If you're shopping on a budget and want a basic lift chair without too many optional features, AmeriGlide lift chairs are the preferred option for a thrifty shopper. To compare lift chairs, click the compare checkbox on multiple products and click the compare button to the left.